This dried Lavender material can be made into various products, craft items or for culinary use in teas and Herbes De Provence. It is not hard to find dried Lavender for sale or to buy it cheap wholesale. Drying your flowers is simple and easy. Let me tell you how to harvest Lavender, when to harvest and how to dry Lavender Flowers plus dried Lavender uses. Lavender can be preserved by drying. When it comes to drying Lavender flowers you have the following choices. Harvest and dry Lavender for later use such as craft projects or make craft items out of freshly harvested flower stems and then allow them to dry. For some dried Lavender crafts it's necessary to make the Lavender wreaths or other items while the stems are still flexible other wise it's near impossible to fabricate certain items once the stems have fully dried. Take Lavender braids for example or Lavender wands. Dry stems cannot be braided easily and the beautiful batons cannot be woven. These freshly crafted items are beautiful and will dry naturally over time. I have made numerous fresh flower wreaths using a wire form and fresh Lavender flower heads. Simply place in a cool dark place to allow time for drying. Some have dried very nicely and I still have them hanging up. Do you have any fresh Lavender uses you would like to share? Make dried Lavender arrangements by using different flower colors. Place several dried Lavender bunches of different types of Lavender flowers together to showcase the variety and color differences. When to Begin Harvesting & Drying Lavender for Dried Lavender Flowers? Deciding when to begin harvesting the flowers needs to be given some thought. The weather conditions and humidity will play a role as to when you may begin harvesting Lavender for drying. If you have had dry weather for a few days go ahead and start cutting flowers. Morning or evening is fine as long as it's dry. How To Harvest Lavender Flowers for Drying? 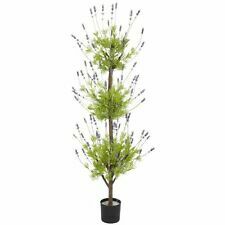 You will need to begin harvesting the Lavender just prior to the flower buds fully opening and when they are of good color. See the harvest picture above. You can simply cut the stems, leaving them long. Lay the stems spread out or bundle them in small bunches and hang upside down to keep the tops straight. Place in a cool, dark well ventilated area to allow for drying and preservation of flower color. Your intended use also plays a role in just when you start to harvest Lavender flowers. See the different developmental stages of Lavender Flower blooms to learn when to harvest Lavender for drying. Harvest Lavender flower on a dry day after the morning dew has evaporated from the Lavender plants. Harvesting the Lavender flower is simple as the buds can be stripped from the stalks using your fingers. Strip the flower buds into a container and then spread out on a cookie sheet to dry for a week. Periodically mix or stir the contents on the sheet to separate the buds and allow for consistent drying. This is how to dry Lavender for sachets as these Lavender buds are perfect for making Lavender sachets. Store dried buds away from moisture and light if not making a craft item immediately. Learn more about safely storing your dried Lavender blossoms. You may also wish to clean your dry Lavender buds before using them. Drying Lavender - How To Dry Lavender? Drying Lavender flowers is easy, just take small bunches of cut flowers and make into bundles. When I make dried Lavender bundles I like to use rubber bands other wise the dried Lavender stems shrink and fall out of the harvested bundles. You will need to replace the rubber bands with raffia, once dried, because the rubber degrades over time. Hang these upside down for drying which will allow for air to reach all sides and to prevent the flower tops from curling over. You use an old coat hanger and clothespin several bunches up for drying at once. Place your drying Lavender flowers in a cool dry spot, away from sunlight and check on their progress every few days. Also don't make the flower bundle too fat or air will have trouble reaching the middle. You want to dry Lavender blossoms on the inside too. The fragrance of dry Lavender or dried items can be refreshed by the addition of pure essential oil in small amounts. You can use Lavender oil to spritz your wreaths, bundles and sheaves or add drops of essential oil to dishes of collected buds or potpourris. When adding to potpourris stir to distribute the essential oils. How to dry Lavender - Keep these harvesting and drying tips in mind. Plant materials needs to dry quickly but away from direct sun to prevent fading and preserve volatile fragrance. You want to retain that lovely color of the flowers. Do store dried materials away from moisture. Placing a beautiful dried bundle, although it may look nice, in a bathroom that gets moisture from a daily shower is not a good idea. Use dried Lavender buds for cooking only if they came from a plant that has not been exposed to chemicals either sprayed or applied to soil or nearby grass. Don't use flower buds for cooking that have had essential oil added to them. Also realize the strong flavor and use dried Lavender for cooking sparingly when flavoring dishes with Lavender. Go ahead cut and harvest that Lavender. Harvesting frequently stimulates another round of bloom in about a months time, and denser, bushier growth. Depending on your location you may have 2 harvests per year. You will have plenty of dried Lavender! There will be plenty of material for dried Lavender bouquets, crafts, and gifts. To get ideas on how to use your harvested materials visit our craft page to see how you too could be making things with Lavender. Did you know that in a good year the harvest from 1 acre of farmed Lavender will yield 15-20 lbs of essential oil? Well it does, and the best oil comes after a dry spell and sunny weather. Do you have to harvest all of your blooms for dried Lavender? I like to leave some plants alone so when I walk by the flowers are there in all their glory. I plant some for harvesting in my backyard because they are not too pretty once everything is cut. Doing it this way you can have the best of both worlds. I like having my cake and eating it too - that is why I harvest some and then leave some on the plant in the flower garden for everyone to enjoy. Dried Lavender Flowers are just another way to enjoy the lovely flowers and sweet fragrance of this wonderful plant. Even old dried Lavender Flower bundles can be useful as fragrant fire starters!